Join us Monday, October 8, 2018 at the Oaks Country Club. Established in 2003, this exclusive golf tournament was designed to provide an exceptional day of golf with plenty of fun, excellent welcome gifts and prizes and amazing food all while raising funds for charity. 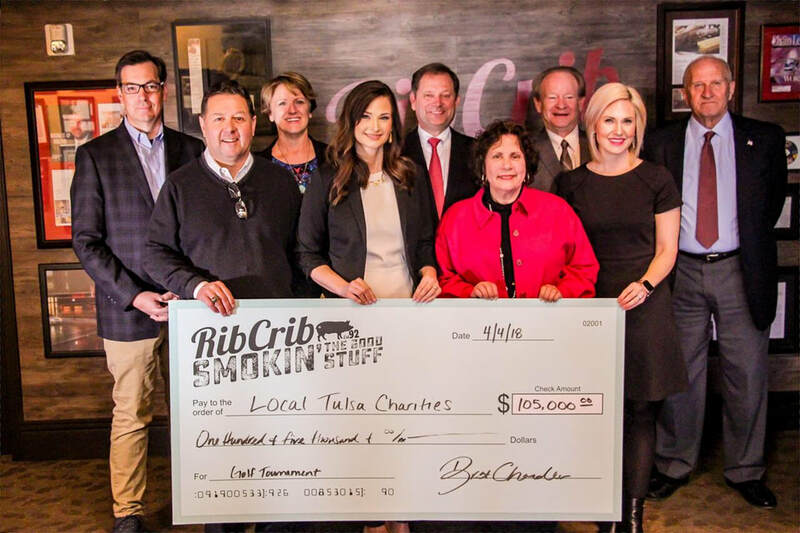 Rib Crib's 15th Annual Golf Tournament Raises $105,000 for local charities! Rib Crib raised $105,000 for five local Tulsa charities at their 15th Annual Rib Crib Golf Tournament. Nearly 150 golfers teed it up for a good cause on October 9, 2017 to support Emergency Infant Services, The Children’s Hospital at Saint Francis, the Pet Adoption League (PAL), the Foundation for Tulsa Schools (FTS) and 12 & 12, all local nonprofits dedicated to helping the community. This is the fifteenth year that Rib Crib has hosted this tournament. Emergency Infant Services (EIS) is a non-profit organization that provides temporary assistance to children five and younger in the Tulsa area whose families are in dire economic straits. EIS provide the most basic of needs: food, formula, clothing, and diapers, along with other children’s items. They provide support for over 17,000 infants and toddlers annually. The Pet Adoption League (PAL) is a non-profit that upholds the idea that pet ownership is a moral, physical and financial responsibility. They are committed to improving the health and welfare of animals in Oklahoma through adoption and a since desire for a wonderful outcome for both the adoptive parents and the adopted animal. The Foundation for Tulsa Schools (FTS) is community-based nonprofit with a mission of building a better community through the support of Tulsa Public Schools by increasing educational opportunities, enlisting community support and business assistance in providing educational resources and opportunities.